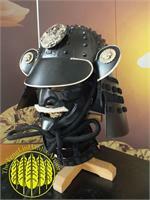 Our aged Samurai Warrior Armor is the newest addition to our rapidly growing line of fine reproduction Japanese Armor. Completely crafted and hand made by the most skilled armor craftsmen in the Fu Rin armory. This is authentic Japanese samurai warrior armor suit and kabuto helmet is finished with ironrusting brown paint, giving it an aged look and feel. Authentically detailed and completely reproduced after actual armor worn by the warriors of the Sengoku period, (1500's). With countless battles that rampaged throughout the nation, only those with power could survive. This reproduction suite of armor is a great addition to any collection or a great start at a collection. Comes full sized reproduction of the aged Samurai Warrior armor comes with everything you see including the black lacquered display / storage box. This set is completely hand made made of iron, leather, silk, brass and other materials that have been used for long years from the Sengoku era in Japan including vermilion/black lacquer helmet, vermilion/black lacquer and navy bindings armor, glove, leg guards and all parts/accessories to wear. This armor comes fitted for a person who stands between 5'2" and 5'10" tall with average body type. The armor can be custom ordered in red, black or vermilion at no extra charge, simply make your request in the comments section of the order form. These are a great addition to a samurai swords collection, and they look amazing in any home or dojo. The Tokugawa clan was a powerful daimyo family of Japan. They nominally descended from Emperor Seiwa (850-880) in the early history of Japan. The beginning of this clan's history is still a bit of a mystery but we do know by in 1567 the Tokugawa clan started its rise to power. By the end of the Sengoku period the Tokugawa clan had grown in size of samurai and land. By the end of the Edo period they ruled Japan as shoguns. There were fifteen Tokugawa shoguns altogether. Their dominance and influence was so strong that some history books reference the "Tokugawa era" instead of "Edo period". This is authentic Japanese samurai warrior armor suit and kabuto is finished with iron rusting brown paint, giving it an aged look and feel. 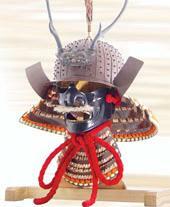 Authentically detailed and completely reproduced after actual armor worn by the samurai warriors of the Tokugawa clan. With countless battles that rampaged throughout the nation, only those with power could survive and having the best samurai armor certainly helped. This reproduction suite of armor is a great addition to any collection or a great start at a collection.